If you read this site regularly you'll know that I've reviewed a lot of headsets. A lot of gaming headsets, I should say. 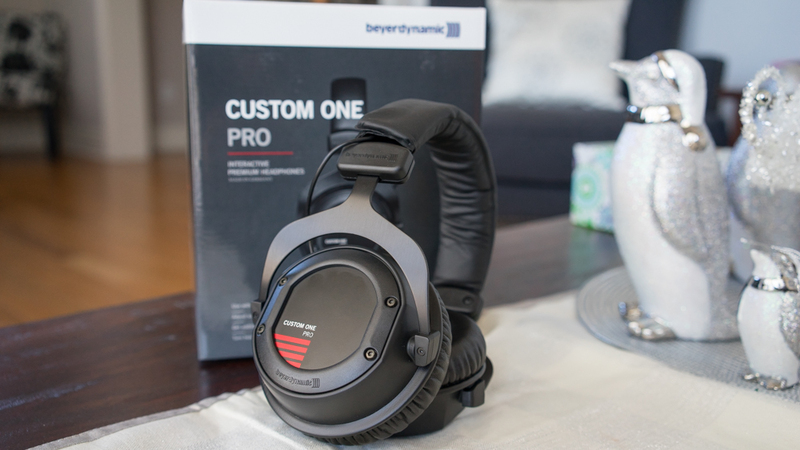 I'm not out to dump on any of them, but I want to start this review by saying that these Beyerdynamic Custom One Pro headphones sound better than any of the phones I've reviewed for this site. To my ears, most gaming headsets have a similar sound formula. Again, this is not to dump on some of these sets, but more often than not they have a constrained upper end, an over-boosted low end, a painfully bloated mid-low end, and everything between these ranges usually suffers for the resulting frequency curve. 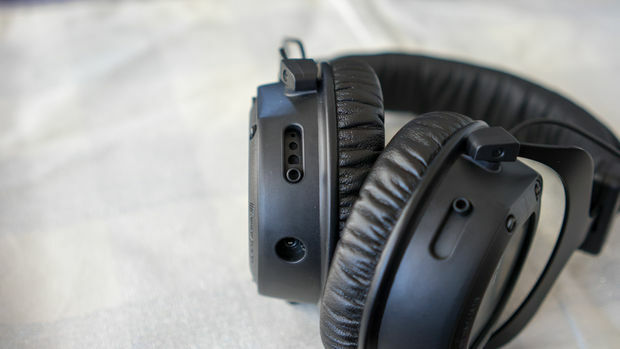 I could get more technical and talk about how they're usually dry, honky, and have weird imaging issues, but I'm not here for a rant, and I'm not out to sound like some kind of headphone snob. I think that any gamer who has tried more than a couple of pairs out can identify that there's a particular sound you get from a lot of these headsets. It's not hard to hear. The 'custom tuning' bullet point you see on the boxes of many of these headsets is to blame most times. But you can't blame the headset makers for doing this tuning as the result is geared toward gaming use. For example, their sharp high end lets you hear the footfalls of enemies in first-person shooters, and that exaggerated low end keeps your ears filled with wooly rumbles at all time. That's what we want, right? But sometimes the digital processing used to get them there takes things too far. So while the headset will hit those bullet-point marks for the high and low end, the details suffer, giving you cold, lifeless audio. So, I have headsets I'll use because they're wireless, have a bendy boom mic, have a nice range and battery life, or have cool glow-y lights. But those are all features that do nothing for sound. I'd much rather have something that sounds better. 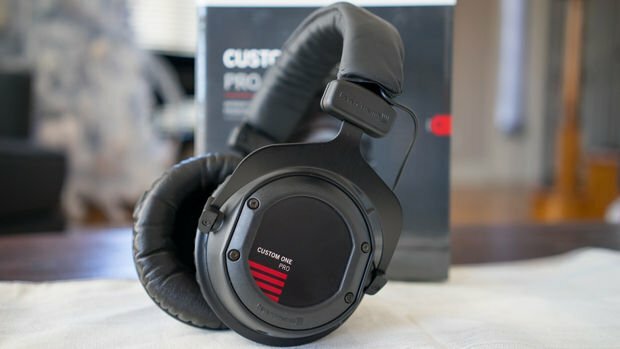 Again, the Beyerdynamic Custom One Pro (MSRP $299, ~$200 street) headset sounds better than anything I've tried. And that's probably because it's a legitimate pair of listening headphones first and foremost, with some options that make it a good gaming solution. So know that you're not going to get the flashy lights or surround-sound features. It's all about great sound here. 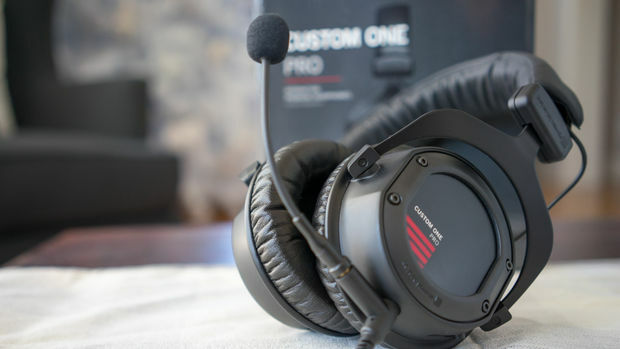 What the Custom One can do is give you your choice of frequency responses, which is rare in what would normally be considered monitor-style headsets. There's a four-position switch on each earcup, letting you customize the sound to your liking. The default setting is a clean and un-hyped frequency plot, giving you a wide, open, and detailed sound. This is sound quality that would make any audio enthusiast smile. These would be right at home in a pro audio setup, and would even work in the studio. But even with everyday listening they sound delightful. If you need more, push that switch forward to one of the more bass-pronounced settings. One click forward enhances the lower range, and another click past that makes bass frequencies take center stage. The last? BOOM! This last setting is a bit heavy for my ears when listening to music, but it made a PS4 session of Killzone: Shadow Fall pretty exciting, if a bit tiring. 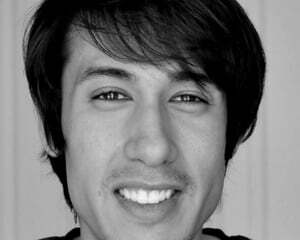 The steps take your ears from delightfully punchy to full-on bass head territory -- something for everyone. Here's the kicker, though. All of these sound modes are dynamic and musical, which is more than I can say for a lot of the gaming headsets with sound tuning options. The full-on bass setting is, again, a bit tiring to my ears, but if you like the boom, it's certainly here. Even the default linear setting is still quite lively in the low end, though. I've been enjoying this set with the response tuned to the first notch, which has proved to be perfect for both gaming and music listening. Side-by-side tests with other headsets had my lip curling at how poorly some of my standby sets fared in comparison. I won't throw any of the others under the bus, but I will say that only set that fared reasonably well in the comparison was my SteelSeries Siberia set, and even then the Beyerdynamic set sounded a fair bit better to my ears. In all cases, the semi-closed-backed Custom One were more open and clean, shining with their unmarred midrange and their amazing imaging. Games and music sounded bigger and more exciting, dialogue was much easier to hear, and explosions and sound effects were more dynamic. In just about every respect the Custom Ones has a clear advantage. The sound isolation is also great, as the world fades out when you put these on. For gaming, the Custom One Pro has another trick up its sleeve. 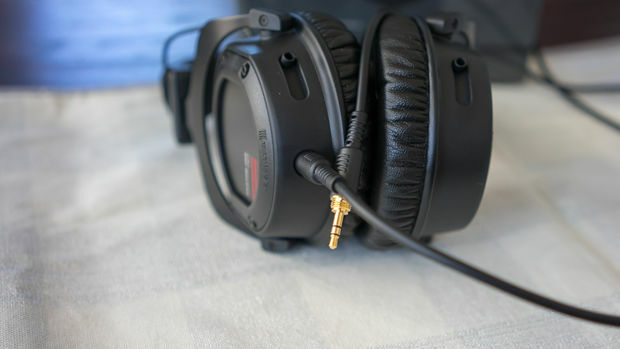 The port at the bottom of the left earcup that lets you plug in a removable cable can also take Beyerdynamic's Custom Headset Gear extension. This replaces the default audio cable with another that has a split Y-cable that lets you plug in the set into headphone and mic jacks. The bottom of the extension has a port where the included gooseneck microphone can be attached. 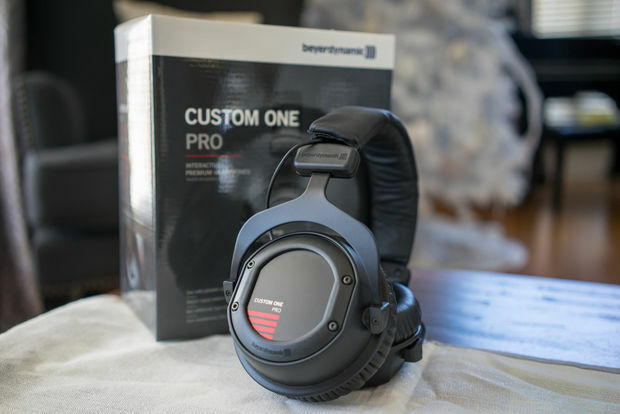 With a quick unplug/plug the Custom Pro One changes from a listening-only set to a gaming/podcasting solution. This Y-cable configuration was good for my gaming PC, but not my notebooks, where a single 1/8" jack handles both signals. I had the same issue with the PS4, as the audio jack on the DualShock 4 is the same kind of all-in-one mic/headset jack, much like the one on most mobile phones. 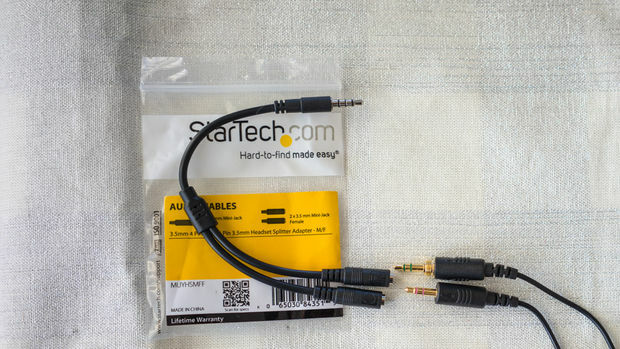 StarTech's $7 headset splitter adapter made for an easy and cheap solution, though it would have been nice to see this adapter included in the headset extension kit. Or, better yet, Beyerdynamic should have included a 4-pin 1/8" jack with in-line mic for mobile/gaming use. Test calls and party chats with the Custom Headset Gear extension showed that the included mic does the job fine, with clean voice coming through. I did find that rotating the gooseneck mic in its jack created a quiet scratching noise, though. The mic is also missing a marking to show where the mic diaphragm is, so you'll have to remove the foam cover to see where it is to set its position near your mouth. Of course, this set will need an amp for game systems that do not have an analog jack. 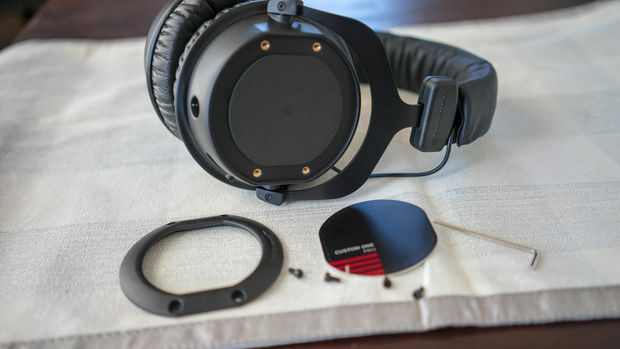 The Custom One Pro comes with an allen wrench that lets you remove the four screws on each earcup to replace the default plates with custom ones. The headband and earcups are also removable to make them customizable as well. The Beyerydynamic shop has several part options already available. These are a very nicely made set of headphones from Germany. The Custom One Pro's metal headband and rugged plastic earcups make them feel solid but keep them light. They're supremely comfortable because of this, perfect for extended wear. Once more, we've never tested a headset for gaming that has sounded this nice. The Custom One Pro is sparkling clean, miles wide, and impressively dynamic, with a soundstage that competes with professional headphones. Gaming on everything from a 3DS to a PS4 showed that these are a treat for the ears, and they performed just a nicely with an iPod and through stereo amps for music listening and movie watching. If you need something that's wireless, digital, or has a bunch of surround sound modes, this set may not be for you. But if you want something sounds outstanding and has a high level of customizability, I can't think of a better set than the Custom One Pro. Highly recommended!